2016 Raffle Rug – Update! This is the raffle rug for the Green Mountain Rug Hooking Guild’s Hooked in the Mountains XVIII Rug Show at the Champlain Valley Expo Center in Essex, Vermont, October 19-23, 2016. The following rug hooking artists made the 8 rectangles and many thanks to them for creating such imaginative designs. They donated their pieces to the guild several years ago. 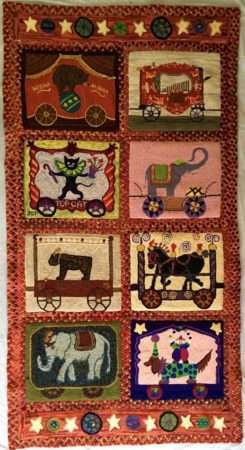 The 8 rectangles had been part of the Circus Train Exhibit at the Shelburne Museum in Shelburne, VT.
Each rectangle has been surrounded with braid, then joined together with a hooked border on the top and bottom and finished off with 2-3 more rows of braid. The overall size is approximately 3 feet 10 inches by 6 feet 11 inches. I am the person who won the Circus Train hooked rug at the Rug Show last year. If anyone in the Guild has time, it would be neat if someone could contact the Library and give them background on the people who hooked the various squares, and maybe some basics on caring for a hooked rug. And of course if you have members over in that area, they might enjoy visiting the rug on display. It is nice to know that many people will have the chance to see and enjoy the rug. We’ll be providing the library a copy of the book that was made about the Circus Train Exhibit at the Shelburne Museum. The eight panels in this rug were part of that exhibit several years ago.